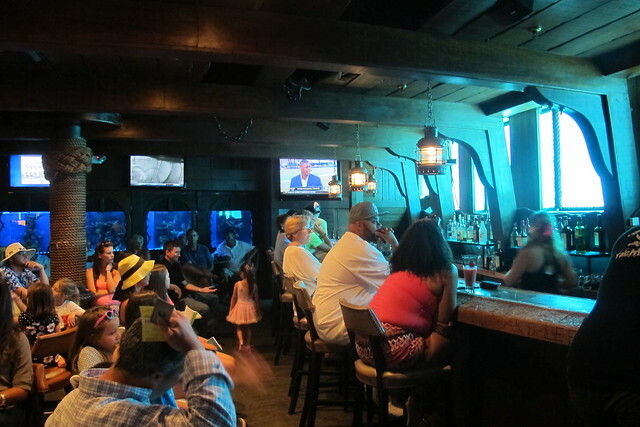 We have all been led to believe that mermaids are just mythical creatures, but you may be convinced otherwise with a weekend visit to the Wreck Bar at B Ocean Resort (formerly Sheraton Fort Lauderdale Beach Hotel). 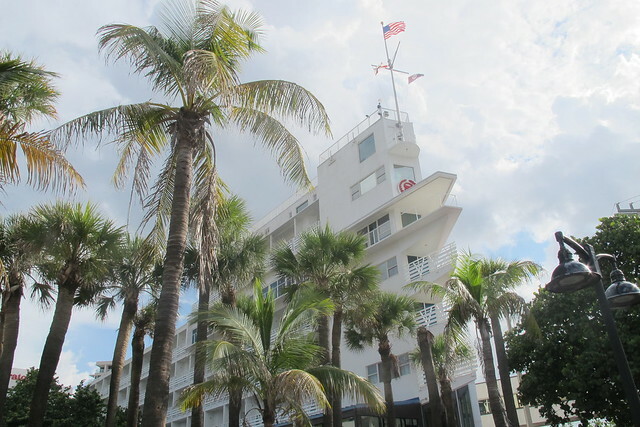 It originally opened in the 1950s as the Yankee Clipper, hence the ship-shaped architecture. 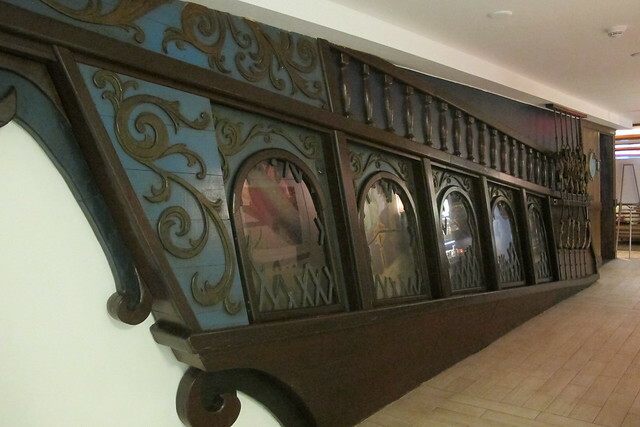 The Wreck Bar, which was built to look like a sunken Spanish galleon, is one of the few porthole lounges left in America. Behind the bar are windows that display an underwater view of the hotel’s pool. 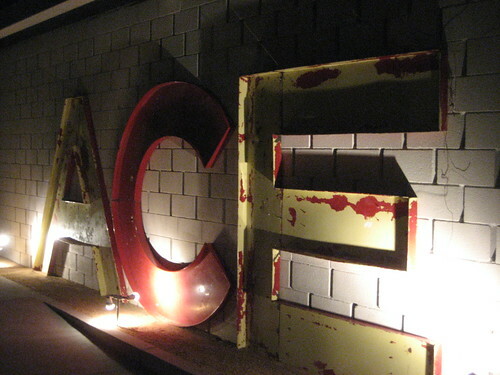 In the past decade, the property has undergone changes in ownership and multi-million-dollar renovations, but the Wreck Bar has managed to stay relatively intact. 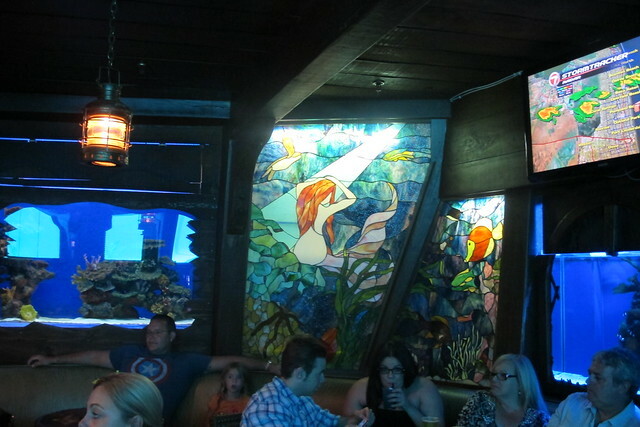 There’s a lovely stained glass mermaid mural, plus neat little details like gold doubloon-type coins inlaid in the tables. Looking up, you’ll notice jagged cut-outs in the wood plank ceiling to reinforce the shipwreck setting. 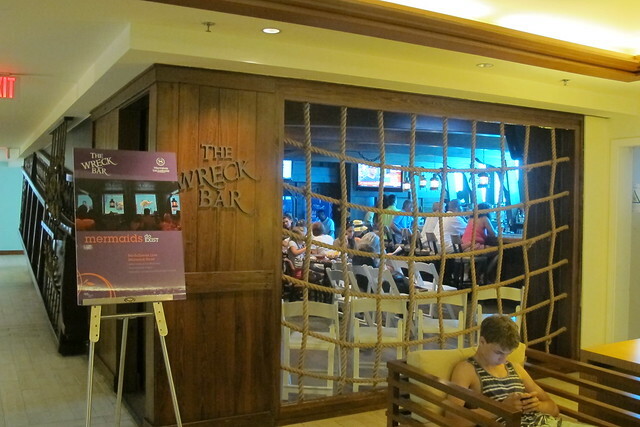 The Wreck Bar has been featured on the silver screen in the 1960 spring break flick “Where the Boys Are,” and more recently in “Analyze This” (1999). A plaque on the wall commemorates the scene with Robert DeNiro and Billy Crystal. While you wait for the show to start, you can take the opportunity to order some grog and/or grub. 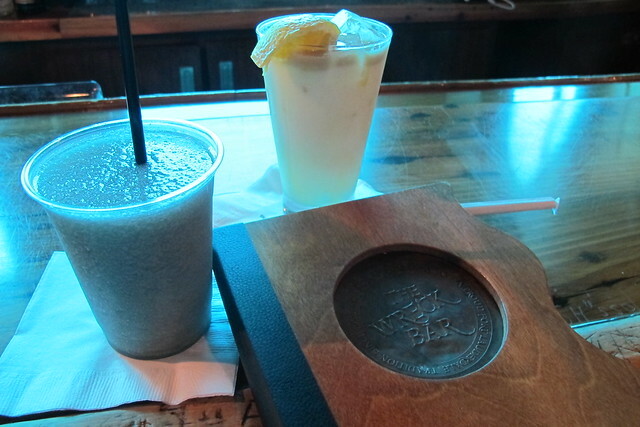 (Pictured is the “Black Pearl,” which used to be a signature drink. You should probably save your serious imbibing for the nearby Mai-Kai, my favorite tiki bar in the world.) The revamped food menu ranges from avocado hummus, sweet soy ginger wings and corn, lobster and crab cakes to chimichurri rib-eye, mahi mahi and jerk guava bbq chicken. 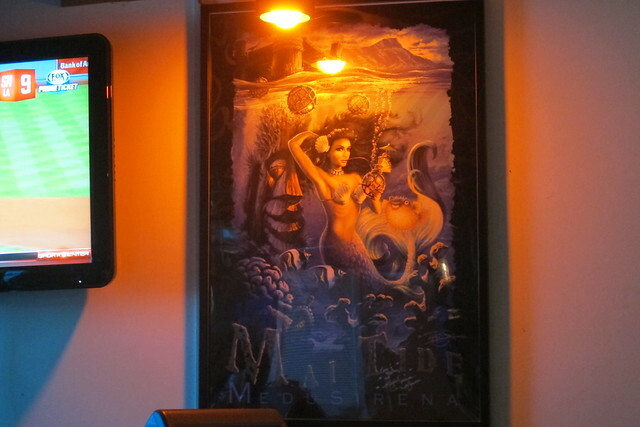 Marina is a famous finned figure on the tiki scene. The Wreck Bar hadn’t regularly hosted mermaid shows since 1962, but she revived this wonderful retro entertainment here and it’s been a success for nearly a decade. She’s also appeared at events like Tiki Oasis in San Diego, Tiki Kon in Portland and The Hukilau in Fort Lauderdale. (And if you’re ever in Macau, you can see her digitally projected at the City of Dreams’ Vquarium.) I’d caught her performance at Vintage Roadside’s mermaid event at Modernism Week in Palm Springs, but there’s nothing like seeing her in her natural habitat. She and the “Aquaticats” she’s trained put on a mesmerizing show, demonstrating such control of movement underwater in their graceful gliding and flips, all the while interacting with the audience via mysterious gazes and flirtatious looks. After the show, guests can go upstairs to the pool level and pose for photos with them. Around Halloween, the Creature from the Black Lagoon has been known to crash the pool party, while Christmas might feature a siren in a Santa suit. There are also special themed shows scheduled during The Hukilau (June 8-12). This was the first year I had the pleasure of attending Palm Springs Modernism Week, a series of events celebrating the architecture and culture of the 1940s, ’50s and ’60s. There were dozens of home tours, lectures, films and cocktail parties from February 16-26. Curiouslaydee and I were there for the closing weekend and some fun in the sun at The Riviera, but first we headed down Palm Canyon Drive to the Ace Hotel on Friday night. 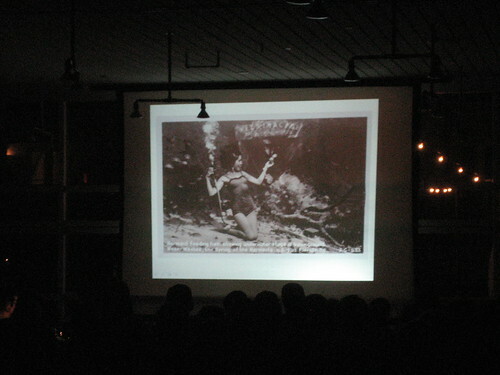 They gave an overview of aquatic shows, from the 1939 New York World’s Fair and Billy Rose’s Aquacade (where Esther Williams was discovered) to mid-century mermaid attractions (like Weeki Wachee Springs, pictured) and porthole lounges (hotel bars with windows into the resort’s pool) to newer ventures like Sacramento’s Dive Bar and the aquarium at the Silverton Casino Hotel in Las Vegas. 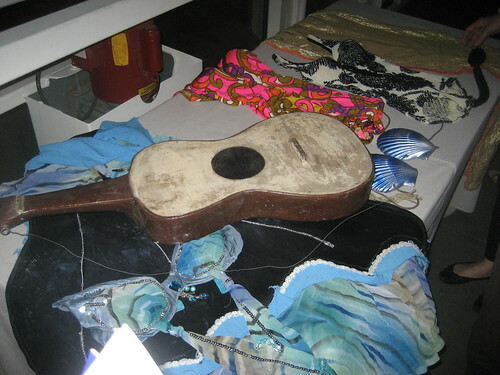 Up front they had two tables displaying mermaid memorabilia, like this blue costume from Sip ‘n Dip in Montana (possible setting for a future reality show), a guitar from Weeki Wachee Springs (still in operation! 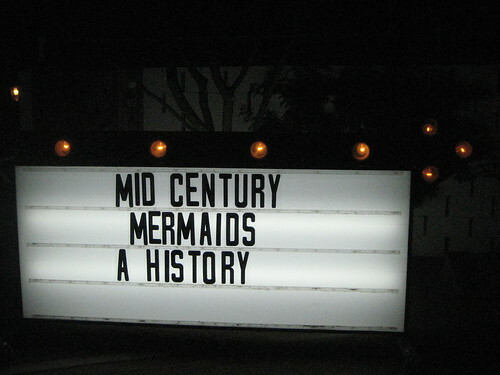 ), vintage bathing suits and a gold tail from Aquarama. 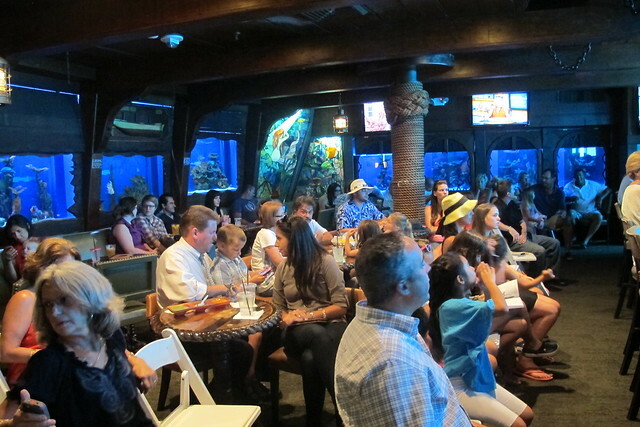 Following the presentation, the crowd surrounded the pool adjacent to the conference room for a special underwater and pyrotechnic performance by Marina the Fire-Eating Mermaid. 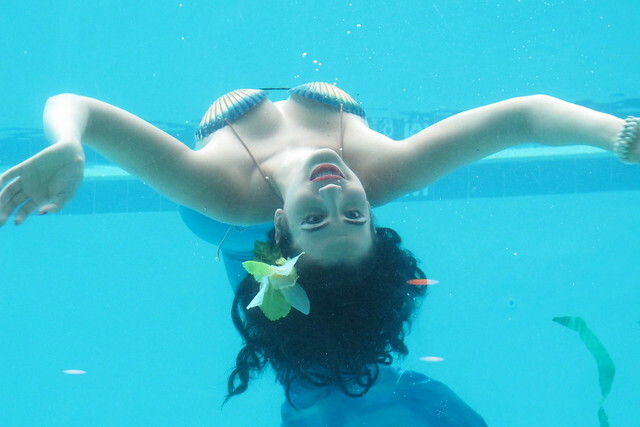 Marina and her MeduSirena Pod of fellow fish-tailed entertainers have a standing swimshow engagement every Friday night at the Wreck Bar in Fort Lauderdale, and she also performs at special events like Tiki Oasis where she’s even held classes on underwater movement for aspiring mermaids. 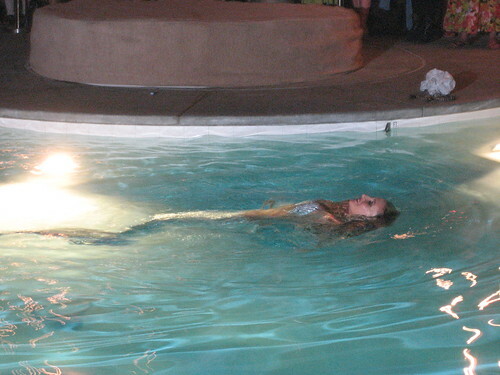 Marina was stunning, of course, but what really blew me away at this event was discovering how many mermaid attractions there were/are across the country. 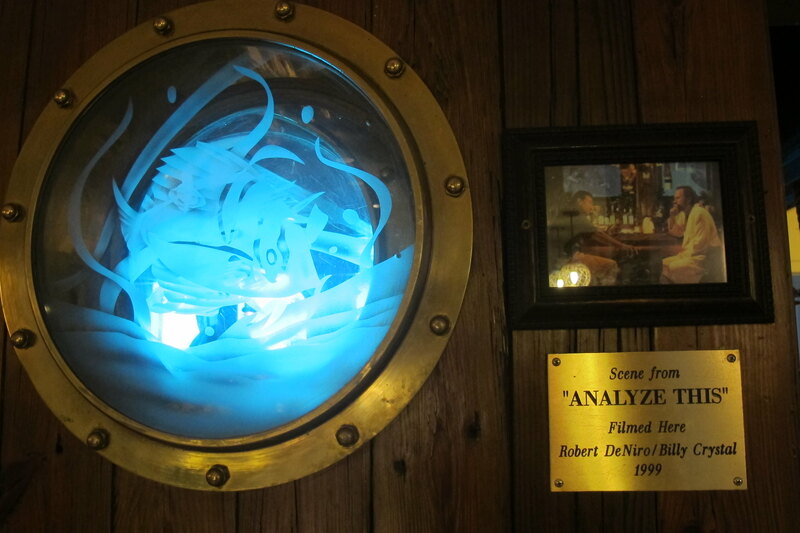 My favorite example was the porthole lounge, but Marina told me there are only three remaining in the U.S. They may be more nautical in style, not really “tiki” per se, but they seem to have that same sense of South Seas escapism that we love about tiki bars.